If every Monday was like today, than let every day be a Monday! My day started off with a text from my boss saying to come in late because, ohhh who cares why, but that was a wonderful Monday morning gift. And while I was getting ready, this little “party” took place in my bed. 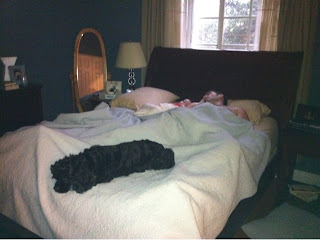 This melts my heart – the three loves of my life – beyond adorable. 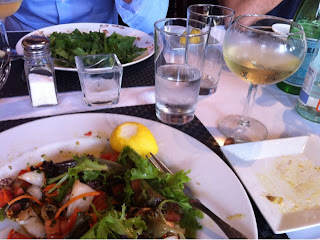 And than later today, we (my team and I) went to a meeting where I enjoyed the most beautiful seafood salad and glass of Ca’Bolani Sauvignon Blanc. 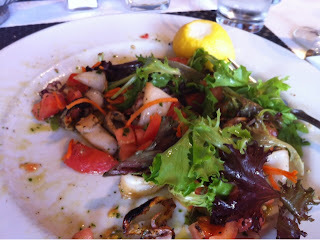 I was debating whether I should take a picture or not, but in the middle of my meal I decided that this salad deserved to be shown on the blog – fresh grilled calamari, mix lettuce, carrots, tomatoes, basil, olive oil and pepper. It was so light and refreshing. It’s perfect for a summer lunch or dinner. 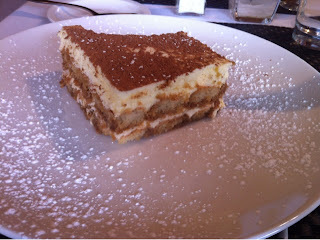 And as if great salad and wine weren’t enough, I had a piece of homemade tiramisu, the real tiramisu;)Just the right amount of espresso, cream, cacao – truly the best tiramisu I’ve have had in the US. P.S. Our dinner plans fell apart tonight – I bought a wrong phyllo dough. I actually bought a puff pastry, so I didn’t make the spanakopita, but don’t think the dough went to waste. I added cheese and egg mixture in between two layers and called it a day. After baking it for 20 minutes on 400F, it ended up actually being pretty good and reminded me of a cheesy croissant. Try it, sometimes great things come out of total disasters. Tomorrow is a big day – one too many doctors appointments for both me and the sous-chef. I am hoping for the best for both of us. P.P.S. Thinking of Giuliana Rancic…Wishing her a successful fight against breast cancer and a fast recovery!